Growing up on a small farm in rural Wisconsin, Carol often heard the saying, “Waste not, want not.” Her mother’s garden shed illustrates the meaning of this expression! To construct the shed, Carol’s father re-used old barn boards, salvaged windows, aluminum, and other repurposed materials. The shed bears the evidence of her father’s creativity, resourcefulness, and his adoration for his wife! 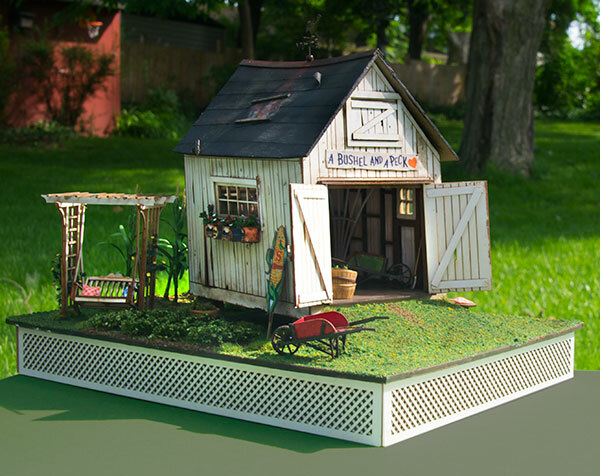 Just like in real life, A Bushel and a Peck uses miniature "recycled" items – tin signs, old barn boards, re-purposed windows, and coffee cans – to create a QUARTER SCALE garden retreat for a farmer's wife! Supported by concrete blocks, the shed has started to lean and the roof is sagging; the farmer patched leaks in the tar paper roof with tin signs; a ladder ascends to the loft; coffee and tobacco cans have been re-purposed as window boxes; the workbench is covered with an old tin sign; crates above the workbench serve as shelves; a tiny padlock and hasp hold the doors closed. 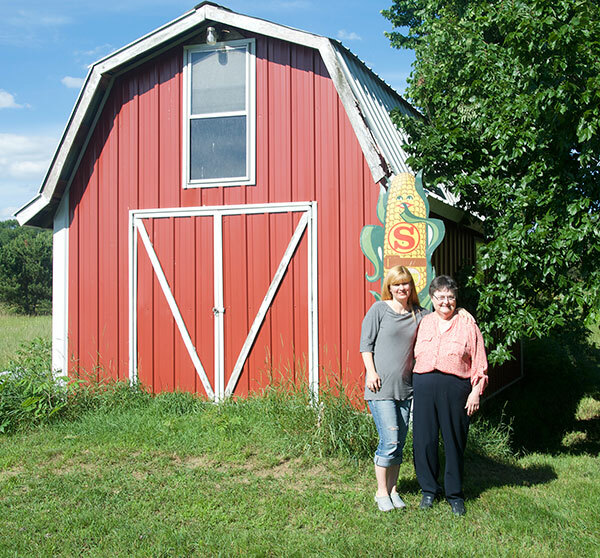 We've even reproduced the seed corn advertising sign (shown behind Carol and her Mom in the photo above) in quarter scale! A special LED lighting kit includes all of the supplies needed to light your Bushel and a Peck with battery powered LEDs. A base unit (which contains a drawer and a built-in switch for the LEDs) is also available, and is perfect for adding a garden landscape!